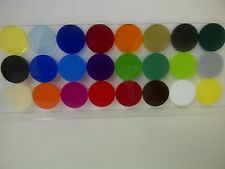 Premium cast acrylic is available in a stunning range of vivid colours to suit all requirements. Use colour without compromising on strength or durability. A wide range of attractive colours are available to suit all tastes and design requirements. Coloured cast acrylic weighs half as much as an equivalent glass panel making fabrication, installation and transportation a far more attractive proposition. Its high gloss finish is not only very attractive but also more practically it's easy to clean. With excellent resistance to the elements, cast acrylic performs very well outside. No significant changes in appearance are expected over 10 years. Cast acrylic can be recycled all the way back to its original raw material monomer. Light transmission Translucent e.g. An object placed behind the material may cause a shadow but will not be seen clearly. The material is suitable to be back lit.